Omega general purpose AC motors are made by one of the leading motor manufacturers for over 45 years, a world-class accredited supplier with a long history of quality testing procedures and standards performed by the finest independent testing laboratories in the world. Our motors are made in high quality ISO9001-certified facilities using only the highest quality material and manufacturing processes. All motors are electrically tested in subassembly production and again after final assembly, and come with an ironclad 2-year warranty. WINDINGS / INSULATION All of our motors have copper windings and are manufactured with Class F insulation. END BELLS AND FAN COVERS All our end bells are heavy duty burnished (polished) aluminum. Our fan covers are steel, not plastic. CAPACITOR COVERS Each motor comes equipped with a large steel capacitor cover with a protective rubber gasket and oversized capacitors. The oversized start capacitor gives the motor a much higher starting torque and voltage range. 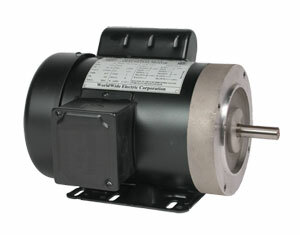 NOTE: These motors cannot be used with VFD speed controls. They run at 1 speed only.